In its latest announcement Holland America Line confirms that the St Lawrence River trade to and from Montreal and Quebec continues to benefit from them having abandoned Bermuda in 2012 in favour of moving its Veendam to the St Lawrence trade to and from Quebec this year. Not all is well in the St Lawrence, however, as Royal Caribbean’s Brilliance of the Seas will abandon its 11-night New York to Quebec autumn cruises this year in favour of shorter 7-night cruises from Boston that sail only to the Canadian Maritime Provinces. Finally, we look at $50 million in updates planned for Oceania’s three “R” class ships, to be precipitated when Insignia redelivers from Hapag-Lloyd Cruises next spring, and Princess Cruises’ latest $30 million spend on its Asian-based Sun Princess. Having abandoned its traditional weekly sailings between New York and Hamilton, Bermuda, at the end of the 2012 season, Holland America this summer assigned its former Bermuda ship, the 1,348-berth Veendam, to join the 1,266-berth Maasdam in the season-long St Lawrence trade. With the 2,104-berth Eurodam also offering autumn cruises that take in Quebec, Holland America is the only cruise line to offer a full season of cruises to and from St Lawrence ports. 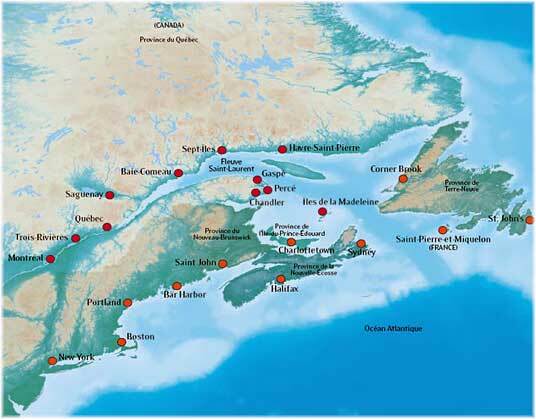 For 2014, Holland America Line has announced an extensive Canada/New England program featuring 48 sailings over the full spring, summer and autumn season. With three ships departing from five homeports, more travelers will be able to experience the region’s breathtaking scenery, historic seaports, culinary treats and cultural charm. Scheduled May through October, the nine different itineraries on ms Eurodam, ms Maasdam and ms Veendam depart from New York, Boston, Montreal, Quebec and Fort Lauderdale. The cruises range from seven to 15 days and include summer cruises as well as visits in the height of the fall foliage season when the now more traditional sailings occur. The months of September and October alone account for 80% of cruise ship arrivals at Quebec. Maasdam starts her 2014 St Lawrence season in May with a 15-night northbound cruise from Fort Lauderdale to Montreal. Guests will visit Charleston, Newport, Bar Harbor, Halifax, Sydney, Charlottetown, Gaspé, Sept Iles, Saguenay and Quebec and Trois Rivieres before reaching Montreal. Highlights include an overnight at Quebec City, a scenic cruise of the Saguenay Fjord and the only Canada and New England sailing to call at Trois-Rivieres. From May through October, the Maasdam will offer 7-night sailings between Montreal and Boston, with calls at Quebec, Charlottetown, Sydney, Halifax and Bar Harbor. The Maasdam concludes her 2014 season with a 13-night October sailing from Montreal to Fort Lauderdale, calling at Quebec, Saguenay, Sept Iles, Gaspé, Charlottetown, Sydney, Halifax, Bar Harbor and New York. A 10-day option is also being offered from Montreal to New York. Veendam kicks off her 2014 St Lawrence season with a nine-day cruise from Fort Lauderdale to Quebec in May. She will make her way northbound with calls at Gloucester, Bar Harbor, Halifax and Sydney as well as Charlottetown. From May through October, the Veendam will offer seventeen 7-night itineraries between Quebec and Boston. Ports of call will include Charlottetown, Sydney, Halifax and Bar Harbor, with an overnight stay at Quebec. 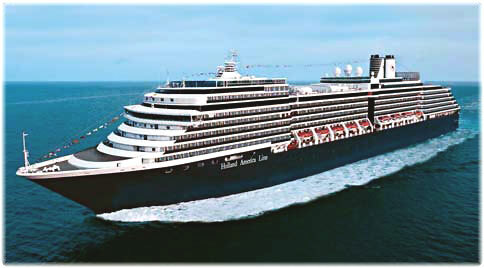 In August, Veendam will add a single roundtrip cruise from Boston that will not make it into the St Lawrence. This 7-night itinerary includes Bar Harbor, Saint John, Halifax, Sydney and Portland, Maine, for its famous lobster. In September and October, the Eurodam will join the Maasdam and Veendam with three 10-night cruises between New York and Quebec, and a 12-night cruise from Quebec to Fort Lauderdale. One 10-night September itinerary will call at Boston, Portland, Saint John, Halifax, Sydney and Charlottetown, with an overnight stay at Quebec. The next sailing will spend ten days calling at Quebec (overnight), Charlottetown, Sydney, Halifax, Portland, Boston and Newport. A third 10-night October itinerary from New York to Quebec calls at Boston, Rockland (Mass), Halifax, Sydney and Charlottetown, finishing with an overnight stay at Quebec. This will be the line’s only 2014 call at Rockland. The Eurodam concludes her New England season with a new 12-night cruise from Quebec to Fort Lauderdale departing October 14. The itinerary begins with an overnight at Quebec and sails for Saguenay, Charlottetown, Sydney, Halifax, Portland, Boston and Fort Lauderdale. Seven-night Maasdam and Veendam itineraries can be combined into an extended 14-night roundtrip journey from Montreal, Quebec or Boston. Although the St Lawrence River has gained many calls from Holland America Line it is noteworthy that, other than Montreal, Quebec and Saguenay, Sept Iles receives only two calls and the newer ports of Baie Comeau, Gaspé and Havre St Pierre do not feature in their plans for 2014 at all. Not all is well in the St Lawrence trade, however, as Royal Caribbean has announced it is cancelling its three cruises in Quebec for the 2,112-berth Brilliance of the Seas. Instead of 11-night cruises in September between New York and Quebec, with a Quebec turnaround on September 29, she will now be leaving Boston on that date on the third of half a dozen 7-night cruises that will take in only Portland, Bar Harbor, Saint John and Halifax and will not proceed as far as the Gulf or River St Lawrence. This is similar to a similar action that Carnival Cruise Lines took a few years ago, when it promised to come to Quebec in 2010 but ended up turning its ships on shorter cruises that served the Maritime Provinces only. The main difference is that Royal Caribbean had already been operating in the St Lawrence, even offering round-trip cruises from Quebec in the autumn. Royal Caribbean’s ships are too tall to reach Montreal, where Trudeau International Airport offers a much better flight service than Quebec’s small regional airport. Quebec will lose two calls and one turnaround. As a result of the cancellations, the Port of Quebec has downgraded its projections for 2013 cruise passengers from 117,500 to 111,000. Despite these cancellations, this will still be the second best cruise season ever for Quebec, with 2012 having been the port’s best year. Statistics indicate that a turnaround passenger is likely to spend $329 on average while a passenger in transit will spend $111. Despite the bad news from Royal Caribbean, two of its ships will still come to Quebec this year and next. 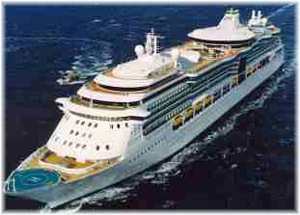 The 3,144-berth Explorer of the Seas will be in Quebec from September 18 to 20, and another visit is planned for 2014. 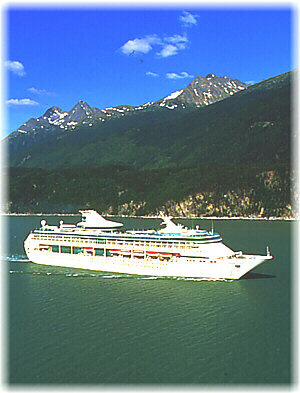 Meanwhile, the 1,800-berth Legend of the Seas will make an inaugural visit to Quebec in 2014. Losing longer-distance calls from ports such as New York and Boston can mean only one of two things really. Either Quebec and Montreal are beginning to suffer from slow-steaming in order for some cruise lines to save burning expensive fuel, or lines are beginning to experiment with shorter itineraries in anticipation of the imposition of the North American Emission Control Area in August 2015, when fuel burnt by all ships will have to be reduced to a maximum of 0.1% sulfur. This will mean that ships have to give up burning cheap heavy fuel oils in favour of the much more expensive lighter distillate fuels. Two ways to avoid this are to steam more slowly, or not to steam as far. Both of these solutions pose a threat to ports such as Montreal and Quebec, which are further away than Canada’s Maritime Provinces, at least on round trip cruises from US ports. As the Columbus 2, presently on charter to Hapag-Lloyd Cruises, is redelivered in the spring of 2014 to Oceania Cruises as their Insignia, Oceania announced last week that is will be taking the opportunity to refit all three of its original “R” class ships – Insignia, Nautica and Regatta. Every cabin on the 684-passenger vessels and select public rooms will be style of the line’s newer, 1,250-passenger sister Marina and Riviera. In addition, the Owner’s and Vista suites will receive new bathrooms that include oversized showers and new vanities. Among the public areas getting a makeover will be the ships’ casual Terrace Cafés, which will also get new grills. The ships will also receive Baristas coffee bars serving Illy coffee and homemade pastries, a concept that debuted on the Marina in 2011. Also receiving refurbishments will be the ships’ Horizons observation lounges, Toscana Italian restaurants, main dining rooms and show lounges. The Canyon Ranch Spas will receive new steam and changing rooms. Insignia, Nautica and Regatta entered service between 1998 and 2000 for Renaissance Cruises and were later taken over by Oceania, while the line’s newbuildings Oceania’s Marina and Riviera were completed more than a decade later, in 2011 and 2012. All three drydockings will take place between April 24 and June 6, 2014, with work on the Insignia and Nautica to be completed in Marseilles, and that on the Alaska-bound Regatta in Vancouver. Meanwhile, Princess Cruises has begun a $30 million transformation on its 2,022-berth Sun Princess at Sembawang Shipyard in Singapore. During the two-week makeover, to be completed next week, the vessel is receiving a new atrium with Princess’ signature International Café, a new sushi and seafood venue, an updated Horizon Court buffet and a refreshed Lotus Spa. Having introduced Princess’s first Japan-based cruise program this year, the Sin Princess will benefit from some new Asian-inspired elements as well as signature Princess features. When Sun Princess emerges next Tuesday, not only will the ship’s new atrium and its International Café feature expanded seating and new décor, but also a new dining venue, Kai Sushi, will be serving sushi and seafood. The Horizon Court will feature contemporary food service areas and stations for a la carte cooking as well as a special pastry shop and coffee bar, refreshed décor and expanded seating. A sophisticated space will also be added especially for the ship’s Sterling Steakhouse experience. The ship’s top deck hamburger grill will be transformed into an al fresco barbeque venue, and the ice cream bar will add specialty coffee options. The Lotus Spa will also get a thorough makeover, with new décor. 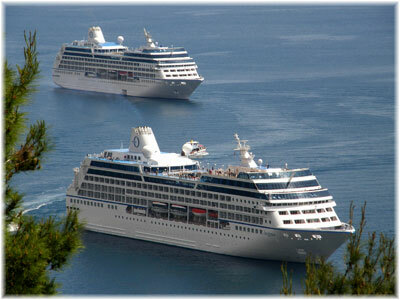 Once out of drydock, Sun Princess will sail on a season of Asia and Australia cruises, before performing a second season of Japan-based cruising in April 2014. 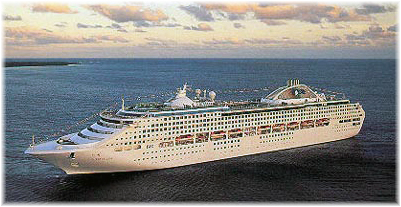 The Sun Princess was delivered in 1995.